John Maynard Keynes (properly pronounced "canes") is widely held to be the most influential economist of the Twentieth Century, and his theories are still given great consideration in the governments of Australia, Britain, Canada, parts of Europe, and of course in the United States. He studied under influential economist Alfred Marshall, attending and later teaching at Cambridge. In a college letter to his friend and lover Lytton Strachey, Keynes wrote, "I find economics increasingly satisfactory, and I think I am rather good at it. I want to manage a railway or organize a Trust, or at least swindle the investing public." He critiqued the classical theory of probability and argued instead for a "logical-relationist" theory, was active in the British Eugenics Society, and supported equal opportunities for women in business. After several years in civil service for the British Government, he was assigned to represent the British Treasury Department at the Paris Peace Conference of 1919, helping to negotiate the international settlements which ended the first World War. He resigned from this position in disgust on 5 June 1919, before the treaty was signed, and first came to public prominence with his outspoken denunciation of the economic terms in the resulting Treaty of Versailles. He wrote a best-selling book on the topic, arguing that the treaty was far too harsh on the Germans, and that demanding severe economic reparations from Germany would cripple that nation's economy and prevent Germany from recovering and rejoining world trade. It was an accurate prediction of an element of the Versailles agreement now almost unanimously understood as contributing to the rise of the Nazi movement and culminating in the Second World War. This book, The Economic Consequences of the Peace, was popular and is now seen as prescient, but it was considered a radical, counterculture screed in its time. It was an obstacle to any high-level position for Keynes in academia or business, at least for the few years it took for the book's predictions to begin coming true. From about 1920 he worked as a columnist for The Manchester Guardian, a left-leaning newspaper where his perspectives were welcome and well-received, and from 1925 he was also a frequent contributor to The Nation, America's long-running leftist magazine. His masterwork, The General Theory of Employment, Interest and Money, was released in 1935 and greeted with widespread acclaim, at least in academic and governmental circles. By the arrival of World War II Keynes was no longer an outsider; quite the contrary, he was a celebrity and acknowledged expert on economics. From 1942 to 1944 he took a leading role in the negotiations leading to the Bretton Woods Monetary Agreement, which laid the foundations for what has became the International Monetary Fund and the World Bank, and he negotiated the terms of the American post-war loan to Britain in 1945. He strongly endorsed William Beveridge's proposal for a major expansion of social services, which led to establishment of the UK's National Health Service. In the same year he was elevated to the peerage by King George VI, becoming Baron Keynes of Tilton and taking a seat in the House of Lords as a member of the Liberal Party. For what he called his "life outside economics", his circle of friends included novelists E. M. Forster and David Garnett, artist Duncan Grant (1885-1978), philosopher Bertrand Russell, playwright George Bernard Shaw, and author Virginia Woolf. He was a very successful investor, and made himself a wealthy man with his stock trades. He collected books, endowed the Cambridge Arts Theatre, and was a generous supporter of numerous charities. He suffered several heart attacks in his last years, before a final cardiac arrest took his life on 21 April 1946. In his last days he said that his greatest regret in life was that he had not consumed more champagne. In an abruptly truncated telling of his economic theory, Keynes was a strong advocate of free markets driven by private self-interest, but he believed that it is foolhardy to allow markets the freedom to ravage an entire economy. Instead he held that governments should intervene as prudent and necessary to ward off recessions, curb excessive inflation, or restore economic vitality. The Keynesian response to a recession or depression is government action designed to encourage spending and discourage saving, and a key component is that the government�s central bank should lower interest rates when prices are too high and raise interest rates when prices fall. His advice to the British and American governments called for a massive public works program to emerge from the depths of the Depression, and he endorsed deficit spending as a response to recessions, a stance that still aggravates fiscal conservatives. 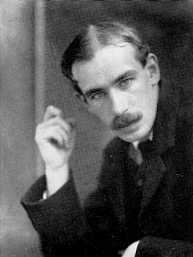 His father was John Neville Keynes, who was at the time a famous and respected economist, though largely forgotten today. His mother, Florence Ada Brown Keynes, was a lifelong activist for causes generally described as "liberal", and became the first woman to serve as Mayor of Cambridge. His brother was a renowned surgeon, knighted Sir Geoffrey Keynes, and married Margaret Darwin, the granddaughter of Charles Darwin. His sister married future Nobel laureate Archibald V. Hill, who researched the mechanical function of muscle and nerve. Keynes himself had numerous lovers of both genders, and married a dancer from the Diaghilev Russian ballet who had been his mistress before divorcing her first husband.